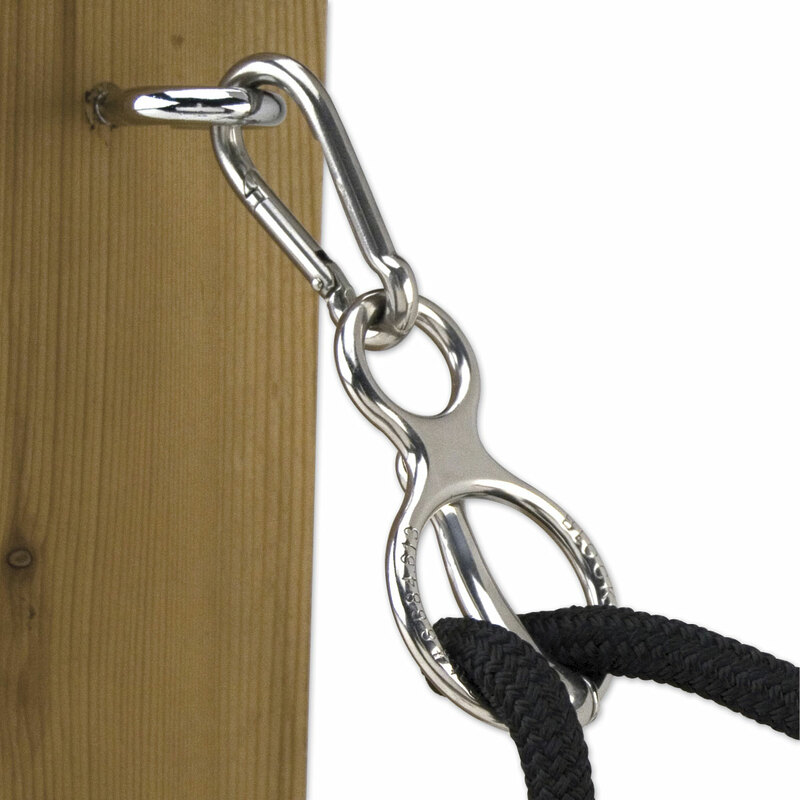 The Blocker Knotless Tie Ring prevents injury to you or your horse. When a solid-tied horse spooks or falls, it can panic - then something breaks or the horse injures itself (or both). Quick-release knots and panic snaps put you in danger as you try to reach them. The Blocker Tie Ring works WITH the horse. When the horse pulls hard on the lead, some of the rope slips through the tie ring - releasing pressure AND the source of panic. If the horse falls in a trailer, it can pull enough slack to get itself back up. No more injuries, or even death, when the halter snap, lead rope, or bungee cord breaks, sending the horse against a post or flipping over onto a concrete floor. Blocker Tie Ring is rated 4.8 out of 5 by 116. Rated 5 out of 5 by PKSL from Life Saver I don't know what I would have done without this tie ring. My rescue horse had severe pulling back issues and he has been able to overcome those issues with the help of this tie ring. I will not tie him to anything without it! Rated 5 out of 5 by Horse Mom from Great idea for young horse My young horse can sometimes get nervous being tied to the trailer at shows, and this tie ring has helped her stay more relaxed. Rated 5 out of 5 by Annette from perfect solution My horse stopped pulling back & flipping over. It’s only been a couple weeks. His injuries from flipping over 8/26/18 are healing. He flipped over between a rock wall & the trailer w/one leg under the trailer. Rated 5 out of 5 by Centaur Equitherapy from Great for my special needs clients My clients sometimes struggle with knot-tying, so it is wonderful for them to be able to lead their therapy horse up to the grooming area and safely tie the horse using the blocker tie ring completely on their own :) A great step towards feeling more independent, and they beam with pride when they are able to tie their horse without help. Thanks! Rated 5 out of 5 by Ms p is saved from Great for panicky horses love this product I have them in my trailers and barn fret product ! Rated 5 out of 5 by Elizabeth from Stopped the pulling back Bought this because my new horse was pulling back when tied. I used this tie ring and he learned to stand without pulling back and freaking out since the ring allowed a little give. He eventually stopped pulling at all. Rated 4 out of 5 by llcombee from Works Great About a month ago my mare was tied to the trailer and was spooked by a horse at another trailer have a fit. When she spooked she sat back and luckily her the snap on her lead broke but unlucky because when it snapped she tripped and flipped over backwards, saddle and all. Luckily she was ok and just going to be sore for a couple of days. I had been meaning to get her a Blocker Tie Ring knowing when she spokes, she sits back. After that incident I bought one that evening! I have several friends that own them and I've seen them work wonders. I just kick myself for not getting one sooner. Rated 5 out of 5 by kjone247 from Works well and is sturdy but the price is kind of high for what you're getting in my opinion. Rated 1 out of 5 by PamelaHR from What a rip-off- no SmartPak customer service. I have asked in three different emails for customer service regarding this item. I ordered 2 but only received one. Not one single response from SmartPak except for a request that I write a review. Rated 5 out of 5 by Abi97 from I absolutely love this thing My old barn got these a couple years ago and it worked wonders for my spooky mare, as soon as she spooked and started pulling back this thing gave her the rope, gave her her head and she calmed down enough for me to grab her. I just recently purchased a horse who likes to pull back on the ties and was worried about him pulling back too far and panicking so I bought one for myself. Haven't used it with him yet but very excited to try it with him!